At first i thought it was a joke from Ryan when he said he's gonna give me try Bear Milk, because we're MMU'ians and we stayed in Bukit Beruang, Malacca for so long but we nvr saw any Bear before ! 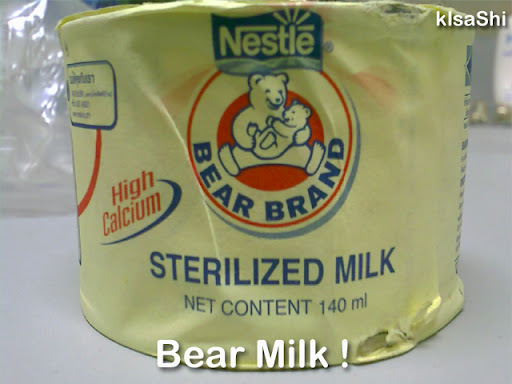 When i arrived at his hostel he showed me the cans of Bear Milk, which is hard to get in Malaysia lols. He said it's high in protein and nutritious tho, i can't read the ingredient and content because it was mainly written in thai.